The Schaumburg C GAP states that the village motto is “Progress through Thoughtful Planning.” Couched within this context of rational planning, this new “Comprehensive Plan addresses future land uses, sets policy guidelines, and emphasizes the importance of preserving natural areas” (Village of Schaumburg 2008, p. 10). Schaumburg created the Schaumburg Biodiversity Recovery Plan in 2004 based on the Chicago Wilderness Biodiversity Recovery Plan that came out in 2001. That plan “provides specific guidance for maintaining, restoring, and preserving the integrity of open space in the village” (Village of Schaumburg, 2008, p. 10). It has received recognition from Governor Pat Quinn and received the Excellence in Conservation Award. Awards and recognition for conservation, restoration, and bringing backyards back to a more natural state could be highly successful in promoting biodiversity and habitat preservation in the Schaumburg area. In order to educate the public on the beauty and value of natural areas and biodiversity, highlighting residences and businesses who are actively pursuing land restoration on their own properties could help inspire others to do the same. If Aldo Leopold’s Land Ethic was integrated into the C GAP itself, as well as education programs, it could provide a guiding ethic to sustainability in the suburban landscape. Although it is believed that Aldo Leopold himself never visited Schaumburg, his children visited the log cabin at Spring Valley for a Leopold Foundation meeting. His work is an inspiration to many who promote conservation in the area. To foster residential and commercial support of biodiversity, the Village could implement a “Where’s Aldo?” program, where each month a different residence or business is highlighted for its sustainability efforts. A placard could be placed in the lot for the duration of the month and further recognition could be awarded. Since Schaumburg is home to so many corporate headquarters, this could provide a wonderful opportunity for corporations to give something back and be noticed for their efforts. Businesses and educational institutions have already been recognized in Schaumburg for their conservation efforts. 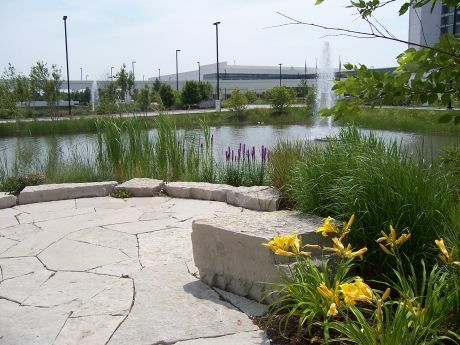 The Village of Schaumburg received the 2010 EPA award for Conservation and Native Landscaping for the Renaissance Schaumburg Hotel and Convention Center Project. 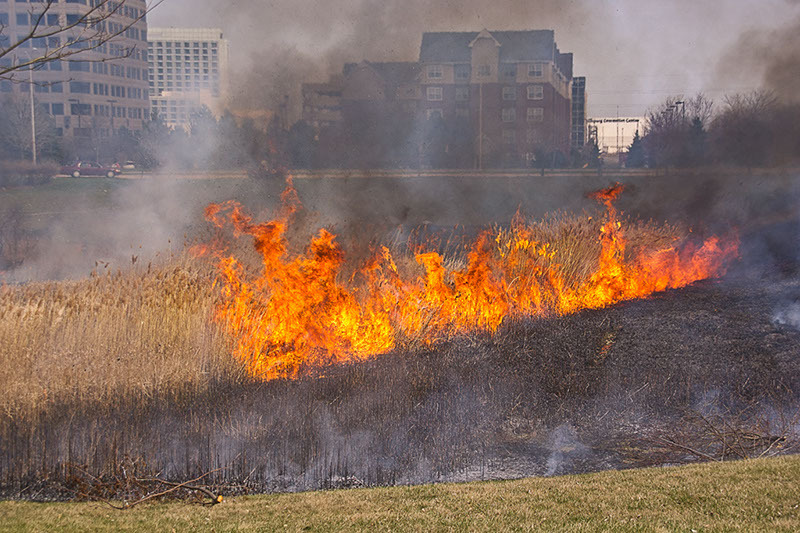 The Environmental Protection Agency and Chicago Wilderness chose this project because the 7 ½ acres of ponds, wetlands, and prairies trap pollutants, reduce run-off, clean storm water, and increase biodiversity and habitat for various species. Through the use of native planting, herbicide use has decreased by half, maintenance time by one-third and water usage has been decreased as well. Paths and bridges help visitors to come in close contact with nature even in the suburban landscape. According to a press release by by M. Follert (2010), “Through the awards program, these organizations hope to raise awareness about native landscaping and encourage others to adopt sustainable practices.” The more businesses and residences that promote sustainability, the more it will take hold in the community. Moreover, sustainable landscaping can help businesses actually save money in the long run because water and maintenance costs are lowered. Roosevelt University’s Schaumburg campus, located in the heart of Schaumburg’s shopping and corporate headquarters district, is also taking steps to be more sustainable. The University has hired Landscape Architect Bill Bedrossian to revamp the campus’ landscape to make it a haven of restoration and biodiversity. Rain gardens, cisterns, wetland restoration and bioswales will be incorporated to help collect and clean storm water run-off. Native prairie plants will be planted to beautify the campus, decrease herbicide use and require less maintenance. Plans for a demonstration community garden and self-sustaining greenhouse are also in the works. With the new Sustainability Studies program at Roosevelt, the green campus will allow students a hands-on opportunity to learn about sustainable practices and get up close with nature. Aldo Leopold developed his land ethic, not in the classroom at Yale or in his office at UW Madison, but by working to restore his land. The restoration efforts at Roosevelt will help students to get hands-on with sustainable techniques and become stewards of the land. The campus will also provide a wonderful example of how beautiful and beneficial sustainable design can be in a suburban landscape. The problems and challenges in conserving biodiversity and fostering sustainability are indeed complex and deep rooted. Beatley (1994) explains that there “has been the inefficient and wasteful nature of land usage. The dominance of the automobile, the impact of federal subsidies provided for home ownership, major federal investments in a national highway system, and equal neglect of mass transit, among other factors, have led to the spiraling land-intensive patterns of development in the United States” (p. 146). Schaumburg’s development up until recently has certainly reflected that pattern. However, times are changing. Schaumburg is embracing sustainability, much like its big sister, Chicago. There is a real opportunity here to redeem Schaumburg’s reputation of the epitome of sprawl to a place where biodiversity is embraced and nurtured. Schaumburg, through the adoption of Aldo Leopold’s land ethic, could become an example of how a suburb can become a model of sustainable growth. By realizing the value of the whole community, this focus will help to ensure the continuation, health and growth of natural systems for Schaumburg and for biodiversity everywhere.